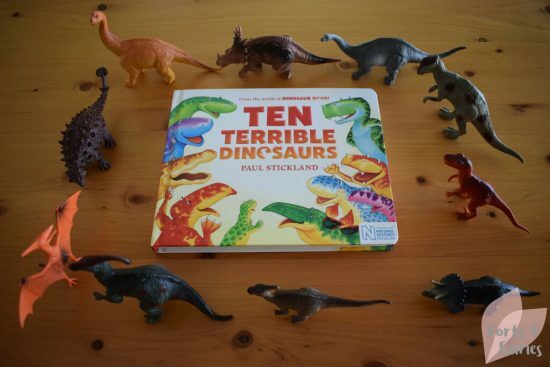 This hardcover board book edition of Ten Terrible Dinosaurs is a wonderful way to introduce your little ones to counting and dinosaurs. The book is a rhyming countdown that features bright and colourful dinosaurs having fun, but gradually the mischievous dinosaurs are fewer and fewer as one gets tangled up doing a crazy jive and another gets stuck while hiding in a tree. Most children seem to love dinosaurs, not surprising given their unique characteristics and interesting names. If you’re read the wonderful Dinosaur Roar! you will be familiar with the world that author Paul Stickland has created, with this title now being published in a new remastered edition in association with the Natural History Museum. Your kiddies will love to count the dinosaurs and will enjoy the rhyming fun too. As you turn each page the countdown will continue with each number highlighted in a different colour on that page. As you countdown from ten to one, the book ends with a terribly fun roar as the dinosaurs join up to give their sleepy friend a surprise. 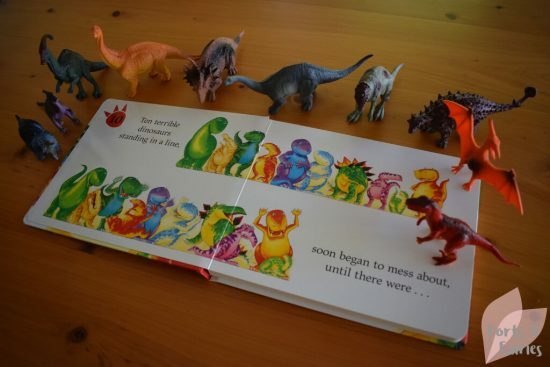 The last page features the numbers one to ten with the matching number of dinosaurs next to each corresponding number. Ten Terrible Dinosaurs is available from bookstores and online retailers for a recommended retail price of R125. Thanks to Pan Macmillan for letting us practise our counting with these Ten Terrible Dinosaurs.